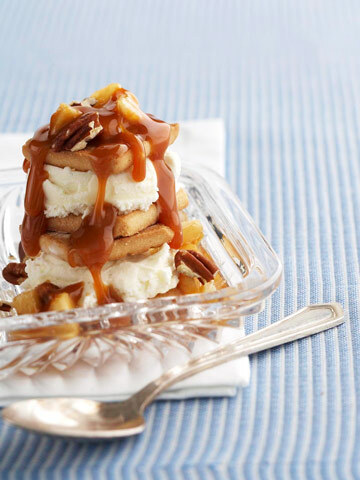 Purchased shortbread cookies and ice cream make the base of this dessert. Then it's topped with a warm pear and caramel sauce. Place a small scoop of ice cream on the bottoms of half of the cookies. Top with remaining cookies, bottom sides down, pressing together lightly. Place in an airtight container and freeze until ready to serve, up to 1 week. To serve, combine pears and caramel topping in a small saucepan. Heat over medium-low heat until pears start to soften, 5 to 8 minutes. Remove ice cream sandwiches from the freezer. Let stand about 5 minutes. Place 2 sandwiches in each of 8 serving bowls. Top with caramel mixture, nuts, and whipped cream, if you like. Makes 8 servings.